The Holy Napkin, or the icon “Not Made By Hands”, is the very first icon ever made, and it was made in a miraculous way by Christ. King Abgar of Edessa, from his kingdom neighboring Israel, had sent his court artist to invite Christ to come to Edessa when he heard that the Lord was being persecuted in Israel. The artist was also asked to bring back a portrait of Christ, because the king, who had leprosy, felt that if he could only see the likeness of this Man that he had heard so much of, that he would be made well. The artist tried many times to capture His Face, but was unable, so the Lord Who loves man, knowing all things, took a cloth and brought it to His Face, and a true likeness was impressed on the cloth, which was sent to King Abgar and healed him. 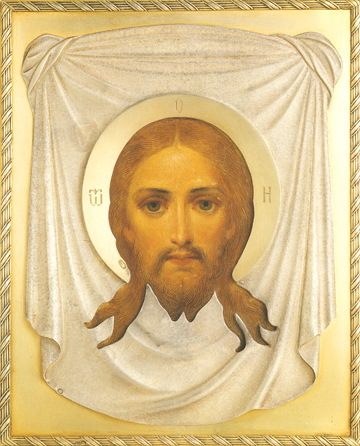 Thus this first icon was not made by human hands. Later the Apostle Jude Thaddeus was sent to preach to this kingdom, and they converted to become one of the first Christian states. The original Holy Napkin cloth was kept in Edessa until 944 when it was brought to Constantinople, and it is the pattern from which all subsequent icons of Christ are made.